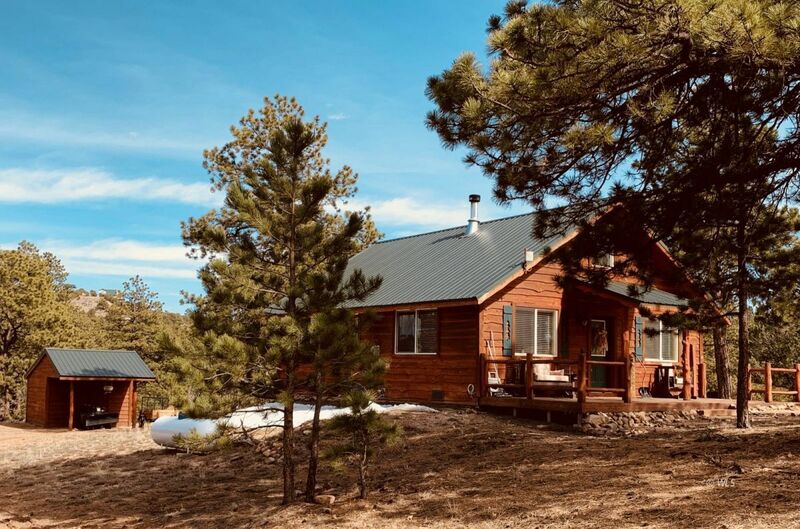 This modern, pristine, mountain cabin in the Ponderosa pine forest is located toward the end of a cul-de-sac in a private setting. The open living room has a beautiful soapstone fireplace and a new propane heater. The kitchen has hickory cabinets and stainless steel appliances and even a dishwasher! The master bedroom, bull bath, and laundry room are conveniently located on the main floor. The second bedroom is up the custom built cedar staircase, along with a loft area that can be the family room or another bedroom. Shoshone Trail is plowed and mail is delivered to this address. A new well was put in place in 2017 and at that time recorded 6 GPM. The home and shed both have cedar siding and metal roofs. Property borders the Cuerno Verde open space for hiking or just added privacy. You will enjoy sitting on the deck watching the wildlife!Directions: From Westcliffe go south on Hwy. 69. East on CR 328 (Rosita Rd.). Right (south) on CR 320, then right (south) on Wykagyl. Right on Kiowa, left on Cheyenne and left on Shoshone Trail. Home is on the right toward the end of the cul-de-sac at the sign.